Middlewich historian and Clerk to the Middlewich UDC Charles Frederick Lawrence was a prolific collector of poetry and verse, particularly when it pertained to the town of Middlewich. Here, for Shrove Tuesday, is a famous poem about the pancake bell which Mr Lawrence says in the publication Bygone Middlewich (Electro Bleach Club, Scientific Section, Middlewich, 1921) only ceased to ring, along with the Curfew (or 'Curfue') Bell within his 'recollection'. So we're probably talking about sometime in the early to mid 19th century. 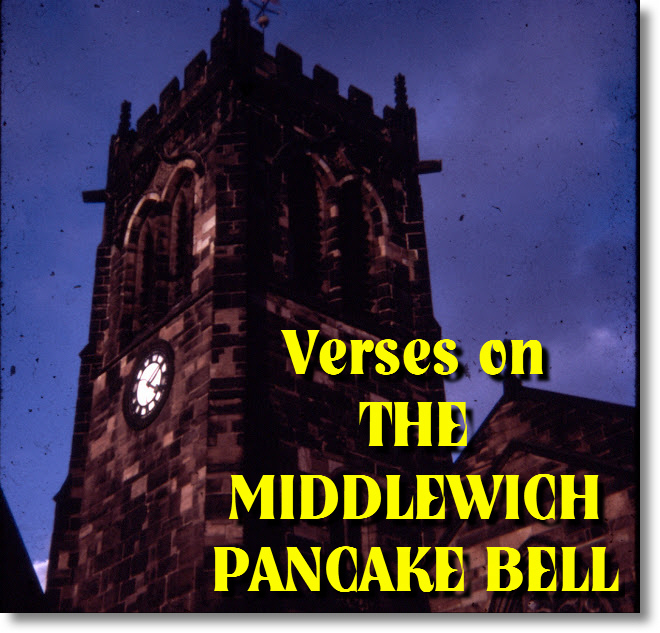 The Pancake Bell was rung to remind the people of Middlewich that it was time to gather all the ingredients together to make pancakes for the great feasting before the fasting period of Lent began. Shrove Tuesday does not occur on the same day every year. Like Ash Wednesday and other Christian 'moveable feasts', the date is determined by the date of Easter which falls on the first Sunday after the first ecclesiastical full moon that occurs on or after March 21st. The beginning date, March 21st, was chosen because it is usually the vernal equinox (generally, the first day of spring). That is why this diary entry was published on the 13th February 2018, and the 5th March 2019. It will be interesting to see how the dates differ as the years progress. As it sweeps along through the sky so clear? For I wot it is the Pancake Bell. As sure as she hears the Pancake Bell. And the eggs are brought home and there's flop! flop! flop! While merrily rings the Pancake Bell. That follows the sound of the Pancake Bell. With hope as she hears the Pancake Bell. Its old, old story - the Wedding Bell.